When Doug Williams built a primitive burglar alarm for a 6th grade science class project, he didn't realize he was planting the seed for a future business. Following graduation and a ten year stint in radio broadcasting, Doug decided to pursue his interest in alarm systems by going to work for a regional alarm company. In 1990, he decided to take his passion to the next level, and teamed up with a former associate and created Securitec. Their mission was simple: to do it better than the way it was being done. With one used truck, a few rusty tools and a staff of two, the adventure began. 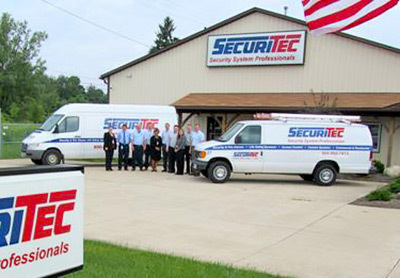 With a genuine focus on client satisfaction, Securitec quickly became well-respected as a full-service security system provider throughout Northeast Ohio. Specializing in developing custom security solutions for the unique and individual needs of clients on residential and commercial projects, Securitec's initial product offerings included home and business security, fire alarm systems, camera surveillance systems and access control systems. As the company's capabilities and staff of professionals expanded, so did their product and service offering. Telephone, voice mail and paging systems soon followed, along with data networking, audio/video, home theaters, intercom, home entertainment and automation systems, and central vacuum cleaning systems. Securitec's continued reputation for high standards and superb workmanship has earned them the opportunity to be involved with many esteemed projects, such as the design, installation and maintenance of critical life-safety systems protecting personnel in Ohio's prisons and county jails. Other large-scale projects include work for the National Park Service, Ohio Department of Corrections and other state agencies, various schools districts, churches, hospitals and senior care facilities. Securitec takes care and pride in every job, no matter how large or small. Securitec continues to grow each year thanks to its dedicated staff of over 25 professionals who all share the desire to exceed client's expectations. The company provides the latest technology without losing sight of the most important reason for their success: their clients, who have entrusted Securitec with their safety and security. Following the company's original mission established in 1990, Securitec continues to take safety to the next level by doing it better than it's being done. Whether you're looking to provide added protection to your home or business, industrial or institutional, Securitec welcomes the opportunity to be of service to you.